Small, countertop oven that is used to efficiently and easily prepare a wide variety of foods. Often used as an alternative to heating a larger kitchen oven, the Toaster Oven reheats, bakes, broils, toasts, browns, and defrosts small amounts of foods. Typically, the Toaster Oven is manufactured with fast-acting heating elements that are managed with easy to use controls. The control panel may be built with mechanical settings or digital settings. In addition, the heating elements may be conventional that are similar to a kitchen oven or convection to provide more functions within the oven. Standard-sized Toaster Ovens range from 15 to 22 inches wide and from 8 to 12 inches in height. Another version of a Toaster Oven is referred to as a Salamander Oven which is basically an oven used for browning foods. 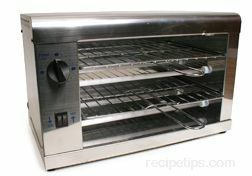 However, this small broiler oven is also used to quickly brown, glaze, cook, broil, or toast various foods. The Salamander can provide a nicely browned crust to a crème brûlée, an au gratin dish or a toasted bread. Manufactured in both small or larger sizes, the Salamander oven units that are larger are designed to be mounted above a cooking range or on a wall. The smaller Salamander Ovens are manufactured similar to a Toaster Oven, so they can be placed on a counter.